yet you can only say so once you get out of maya. such as the various messages, the sacred play and the Kirtan. Truly, it is a day of auspicious and wonderful Lila. And to play and enjoy with you—I wish only for that. 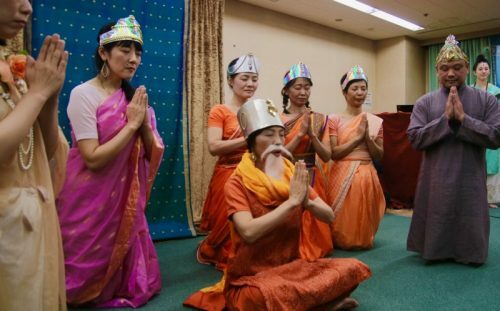 For the occasion of Satguru Jayanti, in Kyoto, disciples from all over Japan gathered, along with 11 disciples who made the trip from Taiwan (more than last year), where devotion for Shri Mahayogi is quickly growing, and in New York, 8 disciples gathered at the Cave to participate in the ceremony via live web cam. Before the celebration began, all (including those of us who were gathered in New York) became quiet as a shared sense of reverence, extending across time and space, began to build. Soon after Shri Mahayogi’s arrival, OM was recited by a few male disciples, and Priya, quietly and slowly, with great focus, walked towards Shri Mahayogi, who was seated in the center of the space, sat before him, bowed down and offered the Mala to Shri Mahayogi. 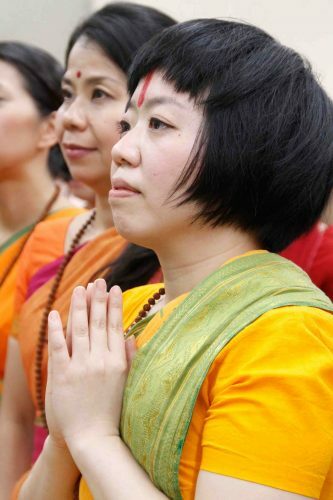 She had just arrived from Taiwan the day before to attend the Jayanti. Then, Devi Suktam (a hymn to the Divine Mother) was offered to Shri Mahayogi by the Arati (ritual of worship; offering of the lamp and songs of praise to God) team.It was filled with Joy and the pure power of devotion that brings everybody together, and it carried praise to the Divine Mother, bowing down again and again to this Divine creative Essence that manifests as all things—the entirety of creation being none other than That. 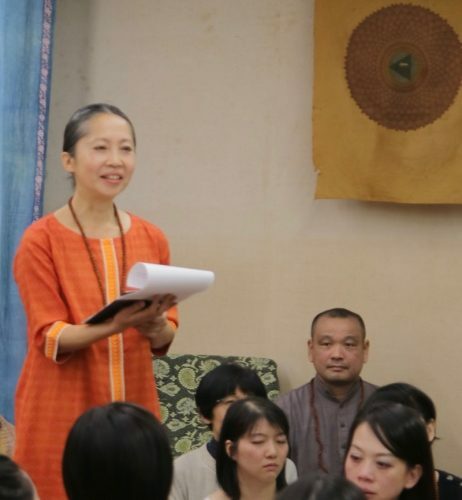 At this year’s Jayanti there were 8 disciples (6 from Japan, 1 from New York and 1 from Taiwan) who had the opportunity to offer their words to Shri Mahayogi (in the form of a Jayanti message). Each one spoke with heartfelt sincerity, and from each speaker we could feel their pure love and devotion for Shri Mahayogi, which can only arise as the result of experiencing true transformation from receiving the teaching and guidance of Shri Mahayogi and then putting it into earnest practice. Each expressed so openly and honestly, in their own way, deep gratitude, honor and respect for Shri Mahayogi, where they are in their own practice, and their desire and efforts to dedicate themselves to establishing the light of Truth, the light of Shri Mahayogi, not only within themselves but within an ever-widening circle. 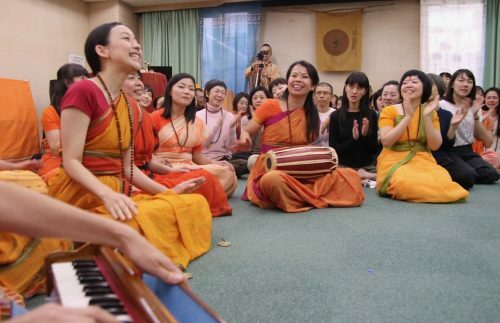 The highlight of the Celebration, by far, was an offering of Kirtan, on behalf of the sangha from Tokyo, that was presented amidst the various messages offered to Shri Mahayogi. her so tenderly, and we could see from his face and his being, that he was also full, feeling her emotion. It was such a powerful moment as Shri Mahayogi and Sarvani were connected into One through Pure Love and Devotion. It took a long time, but finally she was able to speak to Shri Mahayogi. 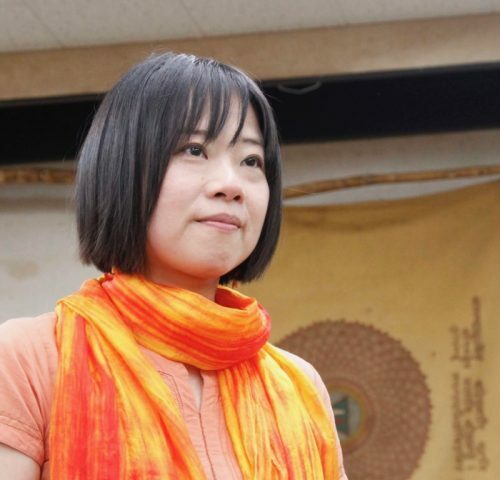 After some silence again, Sarvani began, and others followed her lead. 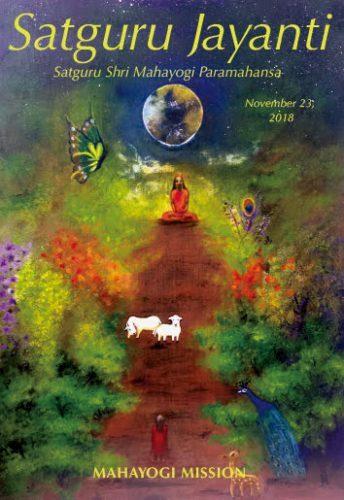 In her voice, filled with praise to Shri Mahayogi, there was the bliss of Ananda, connecting into One with Shri Mahayogi. This bliss of Ananda, through her voice, vibrated and penetrated into everyone’s hearts like waves that emulated throughout the entirety of space. 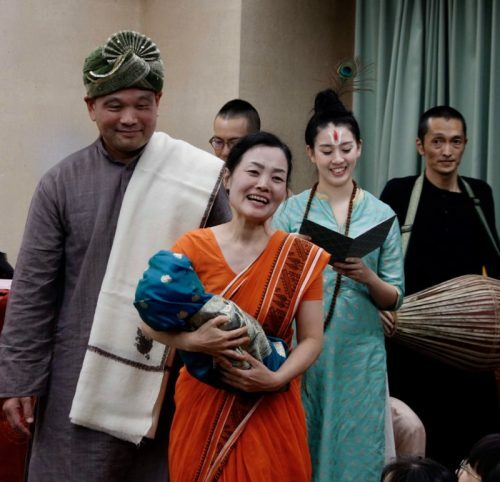 The heart of Kirtan—Real Kirtan unfolded right there…and it was so beautiful, moment after moment! Sing Victory! Praise the Glory of Mahayogi! Sing Victory! Praise the Satguru, the Great Lord! Sing Victory! Praise the Holy Paramahansa! Sing Victory! Praise the Exquisite Gurudeva! 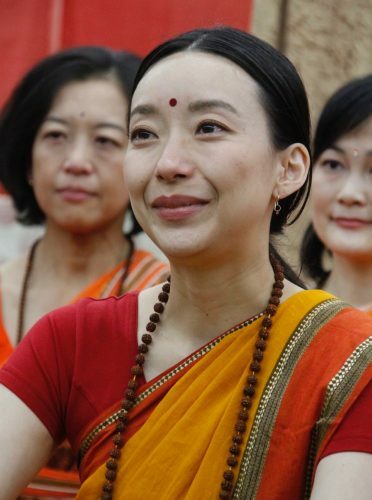 The birth of an Avatara into this world is indeed rare and invaluable, and arises because of the pressing need for Truth to be re-established in the world and the sincere yearning for it from the hearts of the people. 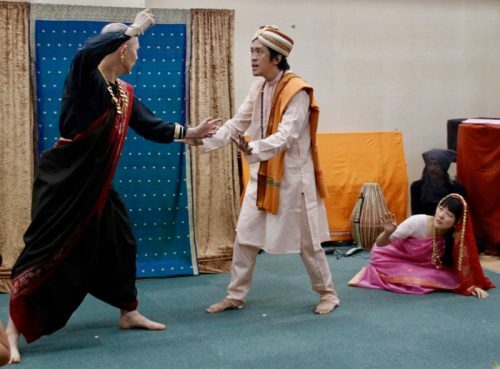 The play, at times serious and at times light and humorous, reminded us of the profound significance of Shri Mahayogi’s birth into this world, and our responsibility as disciples to concretize the teaching within us and carry on Shri Mahayogi’s great mission of Sanatana Dharma in every way possible. 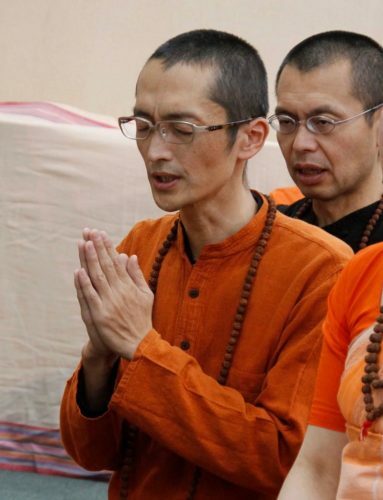 After all messages had been spoken and all offerings made, Shri Mahayogi graciously offered the words written at the beginning of this blog post to his sangha. And to conclude everything, the sangha recited Shri Mahayogi’s Stotram (a hymn written specifically for Shri Mahayogi). What a joyous occasion it is when we have the opportunity to sing praise directly to Shri Mahayogi! We would like to extend our gratitude again to Shri Mahayogi. Jai Satguru Shri Mahayogi Paramahansa Ki Jai !!!!!!! 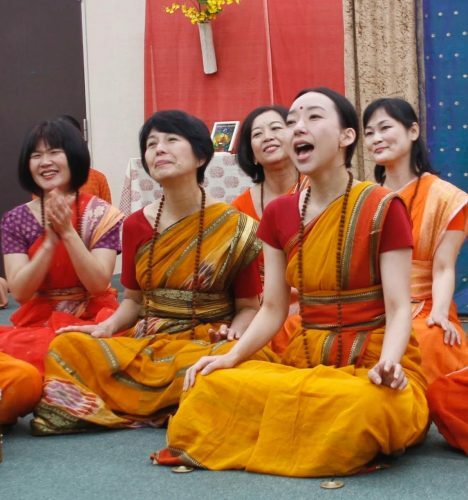 Let us express our gratitude to our fellow gurubai in Kyoto for their efforts to make available and to keep improving the quality of this live broadcasting participation to the disciples in New York! We are very grateful to have the opportunity to see our Beloved Master on this special occasion and be part of the celebration of his Divine Birth. The celebration of Satguru Jayanti never ends when the Master exits the room, yet continues on in the company of sangha. 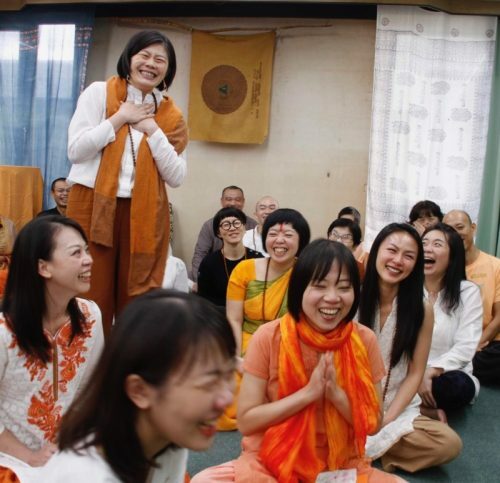 In New York, gurubai, stayed together until the first dawn of morning, sharing about the inspirations we heard in the words of our brothers and sisters who gave speeches and where we are in our own practice. Sleep had no place to enter—for in conversations about the Truth, the purity of inspiration and the serene presence of Shri Mahayogi, enlivens and brings great energy to all! As we left the Cave, a great full moon began to set over the city in the crisp cold morning air! How auspicious this full moon that appeared, marking this holy day of Shri Mahayogi’s sacred birth! In the coming blog post, we would also like to share the Devi Suktam, along with the writing by Mirabai (from Paramahansa) about why this was chosen to be part of Arati.